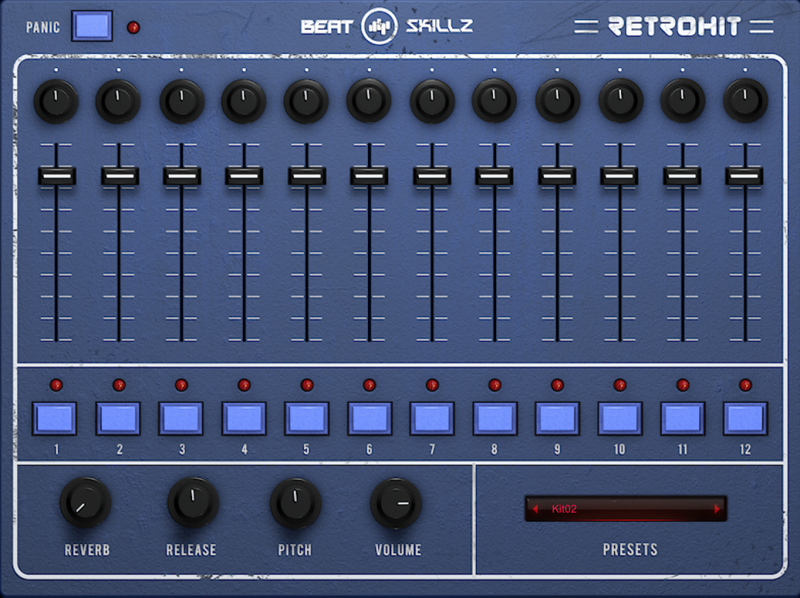 Beatskillz has just released Retrohit – a VST plugin drum machine based on 80’s drum sounds. The idea is to create a virtual instrument inspired by popular bands and artists from the 80’s. All samples were recorded from vintage drum machines, such as Linn Drum, EMU SP12, OB-MX and Fairlight through high-quality preamps and compressors, such as Neve 1073, Distressor and Api 2500. The interface is quite simple and straightforward. The plugin comes with 50 drum kits and each patch contains 12 pads with kicks, snares, hihats, toms, claps, cymbals, FX and percussion. Each track has independent controls for volume and pan. There are Global settings for Reverb, Release, Pitch and Volume. Over 600 drum samples are available also as WAV files so that the user can load them in their preferred sampler or soft sampler. Dry and processed versions are provided. You can, for example, load Retrohit samples on Ableton Live, Akai machines, etc. – 18 hi percussion sounds. Retrohit has available formats for Windows and Mac OSX as well as 32 and 64bit versions.